The 2018-19 NWHL season has quite unexpectedly been riddled with change for the Buffalo Beauts. In less than a month’s time, the team relieved their longtime coaching staff, said goodbye to one of their best defenders, and now is without a GM. Just three days after All-Star defender Sarah Edney played her last game as a Beaut before pursuing dental school in Australia, word came out on the evening of Jan. 8, 2019 that Beauts General Manager Nik Fattey had resigned from his position. This sudden news came almost exactly a month to the day that Fattey had terminated the successful coaching tandem of Ric Seiling and Craig Muni. Outwardly, things appear rather tumultuous for the Beauts right now. On the inside however, the players have a strong handle on things and are led by their experienced teammates. When times like these take shape it is important to rely upon constants. Ones that can help right any ships that need to be righted and can calm the surrounding waters. 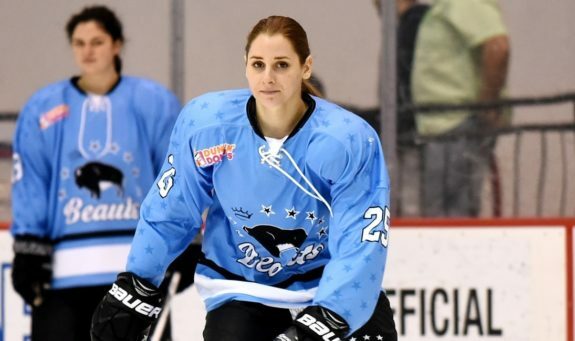 Veteran Beauts defender-forward Jacquie Greco is a constant for this team, and she quite naturally has helped keep the team righted internally no matter what might be taking place at the management level. She and her teammates have achieved a present record of 6-4 through their 10 games thus far. Buffalo Beauts defender-forward Jacquie Greco has played three straight seasons with the team and is an Isobel Cup champion (Photo Credit: Troy Parla). Greco is one of the longest tenured players on the Beauts. Now in her third campaign with the team, her rookie season was played as a member of Buffalo’s 2016-17 Isobel Cup-winning squad. Greco is one of just eight remaining players on the Beauts from that particular team, and one of only six to have spent three full seasons with Buffalo. Current teammates Emily Janiga and Emily Pfalzer were members of the 2016-17 team but did not play for Buffalo last season. At the time of this interview, Greco and the Beauts have six games to go in the regular season before the playoffs get underway. As scheduling would have it, four of the six games are against the Metropolitan Riveters. The Riveters are the same team to have defeated Buffalo in last season’s Isobel Cup Final by a score of 1-0. Greco is one of eight current Beauts to have played in that closely fought game. In her first two NWHL season, Jacquie Greco has played in the Isobel Cup Final (Photo Credit: Troy Parla). With all four Buffalo versus Metro games to be played this season, there is not really a sense of achieving retribution among Greco and her teammates. Rather, it is a matter of the Beauts getting down to business regardless of who they are playing. While Greco may have only played in three regular season games so far, she has remained invaluable to her team in the locker room, at practice and in the community. Even when she is not in the lineup, Greco is easily spotted on the sidelines game-in and game-out supporting her teammates. Now as the playoffs are drawing nearer, a veteran such is she is the type of player that head coach Cody McCormick will likely look to use more of. Since Edney is no longer on the active roster, space is opened up for McCormick to utilize his “extra” defenders. Though Greco has seen some action already this season, fellow third-year Beaut Jordyn Burns has yet not been inserted into the lineup. For the remainder of the regular season and the playoffs, one or both players will indeed be called upon to play defense. Six defenders – Edney, Pfalzer, Sarah Casorso, Blake Bolden, Lisa Chesson, and Savannah Harmon – have played in all 10 games for Buffalo. Greco has the versatility to play either forward or defense, but will likely be called upon to help fill the gap along the blue line left by Edney’s departure. Perennial NWHL Foundation Award Recipient? In the three games that Greco has played this season she has registered a shot on goal and is a plus-two for plus/minus. Off the ice she has continued her penchant of being a positive ambassador for the Beauts, for hockey, and for the Buffalo community. A native Western New Yorker herself, Greco was the Beauts 2018 recipient of the NWHL Foundation Award. A recipient of this award is chosen by the NWHL office as the player most actively applying the core values of hockey to her community as well as growing the game and improving hockey culture. On Jan. 7, Greco and some of her Beauts teammates went to Enterprise Charter School in Buffalo to spend the day with youngsters and teach them the basics of floor hockey. Opportunities to become involved in her community are very near and dear to Greco’s heart. We had a great time teaching ball hockey at Enterprise Charter School today! The 2019 NWHL playoff structure is rather simple. All five teams will make the playoffs. All playoff rounds are single games with no series. The first place team in the league has a bye for the opening round. The fifth place team will play the fourth place team. The winner of that match-up then faces the first place team, where the winner of which goes to the final. The second and third place teams face one another, and that winner goes to the final. Jacquie Greco is one of the natural leaders of the Buffalo Beauts as the team heads down the stretch to the 2018-19 NWHL postseason (Photo Credit: Troy Parla). In some ways, the playoffs are old hat for Greco and the rest of the Beauts. Buffalo has made it to the Isobel Cup Final in each season of the league. They are hoping to make it four for four. Though there are seven players on the Beauts roster who are playing in their first NWHL season, Greco does not feel that postseason play will have them on edge. Rather, it is the type of hockey that they strive for. “It’s definitely new to them for this league,” Greco stated, “but we have a ton of new talent that has been at very high levels before. They’ve been to national championships, Frozen Fours, World Championships. I would say that our newcomers coming in have a lot of really good experience at high level. Something like this is probably nothing new to them. If anything, these are the type of girls that thrive off of that intense competition. If anything, we are looking to the end-stretch of the season, and seeing how it works in the playoffs.